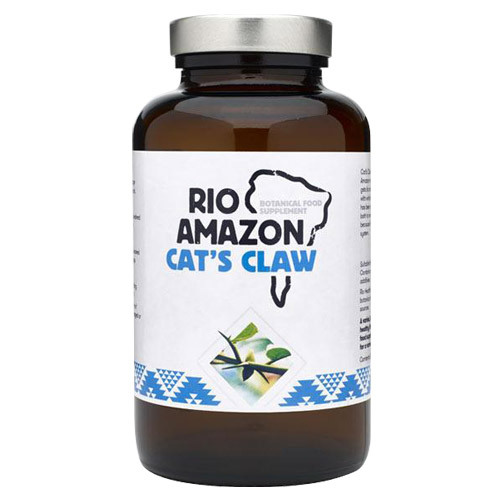 RIO AMAZON Cat`s Claw has been used by rainforest tribes to contribute to the immune system and may help to maintain flexible joints. Cat’s claw or ‘Uña de gato’ is a climbing vine that is native to the Peruvian Amazon and gains its name from the barbed ‘claws’ with which it climbs the jungle canopy. There are many actives in Cat`s claw - including alkaloids thought to contribute to the immune system, and a group of chemicals called quinovic acid glycosides. Other actives are carboxyl alkyl esters, sterols (beta-sitosterol, stigmasterol and campesterol) and antioxidants. Pure powdered bark of Cat’s claw (Uncaria tomentosa), capsule shell: vegetable cellulose. Take 3 vegicaps per day before food or as recommended by your practitioner. Below are reviews of RIO AMAZON Cat`s Claw - 120 x 500mg Vegicaps by bodykind customers. If you have tried this product we'd love to hear what you think so please leave a review. I told my niece about this, a month or so later she rang me to thank me, where she used to have to lift her legs out of bed, she now just gets up. I am 83 years old,and just as agile as I was at 40, this on one a day.